The park includes much of the Southern Patagonian Ice Field – the world’s second largest contiguous ice field beyond the poles. In this image, you can see Brüggen Glacier, also known as Pío XI Glacier, visible in the lower left corner of the image. Pío XI Glacier is the longest glacier in the southern hemisphere outside Antarctica, and has been advancing, first reaching the western shore in the 1960s, then advancing north and south. Yet another ‘inconvenient truth’ that the legacy media keep quiet about. In an adult work this would be the subject of debate as to why in the hottest years evah this is happening. There is a good chance there might some local explanation so it is not a sign of a global trend – reading Landscapes and Cycles tells you that is often the case. Snowstorm to unleash up to 30 cm of snow from Romania to Ukraine. By Eric Leister, Meteorologist, November 11, 2016. A potent storm system will track across eastern Europe this weekend and unleash significant snowfall. Areas expecting accumulating snowfall include northern Romania, northern Moldova, eastern Hungary, eastern Slovakia, southeast Poland and much of central and western Ukraine. A mix of rain and snow will begin on Saturday across the region before transitioning to all snow across western Ukraine, southeast Poland and eastern Hungary Saturday night. Heavy snow will fall at times from the Carpathian Mountains northward to Lviv and Kiev on Sunday. Widespread snowfall of 15 cm (6 inches) is expected throughout this region with local amounts up to 30 cm (12 inches). The heaviest snowfall in Kiev is expected from midday Sunday into Sunday evening. The heavy, wet snowfall could result in numerous power outages while also causing travel chaos throughout western Ukraine. By Sunday precipitation will change to all snow from northern Romania through east-central Ukraine. 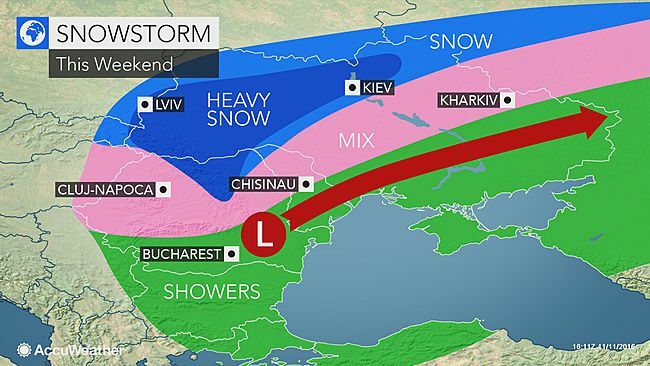 Accumulating snowfall of 2-8 cm (1-3 inches) is expected from Cluj-Napoca to Chisinau and Kharkiv. Reader’s comment: This news is not brought by the Dutch MSM. someone forgot to tell it to melt? It’s called the bipolar seesaw. (And we’re not talking about a playground with mental problems – that’s the climate establishment). Northern hemisphere warming, Southern hemisphere cooling. Often happened in the past, including at the end of interglacials, it’s happening again. Yes, I have seen it often that the poles are asynchronous so we have seen the Antarctic ice grow while the Arctic has reduced. That may well be changing now that there seems to be growth in the Arctic. For the global warmists the creation of energy (“back radiation”) is not a problem. A rising sea level simultaneous with increasing continental ice on Antarctica, Greenland and elsewhere also should not be a problem. This year will be proclaimed (decreed?) the hottest year on record, even though a cooler than usual hottest year.